Tottenham manager Harry Redknapp has revealed his interest in signing Brazilian midfielder Sandro. Rednkapp is keen to travel to Brazil to watch the 20-year-old, who made his debut for the national team this year. "We've been looking at Sandro," said Redknapp. "He can play - he's a modern-day midfield player." Spurs are short of alternatives in central midfield, with Wilson Palacios, Tom Huddlestone and Jermaine Jenas their only options in that area. The departures of Jamie O'Hara, Kevin-Prince Boateng and Didier Zokora have strengthened Redknapp's desire for reinforcements. 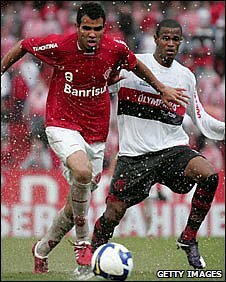 Sandro plays his club football for Internacional as a defensive midfielder. Reports last week claimed Spurs were willing to offer around £14 million for the player. "I'd like to go and have a look myself as well and, if we do decide to do anything, it'll be up to the chairman to push it on from there," said Redknapp. Meanwhile, Redknapp has urged out-of-favour striker Roman Pavlyuchenko to prove himself worthy of a first-team place. The Spurs boss has spoken to Russia coach Guus Hiddink about how to get the best out of the player. ""He's a very laid back guy, Pav, but he's got good ability," Redknapp said. "We both feel he's technically such a good player. But he just needs to be a bit more aggressive. "I'm looking for a big performance from him. A performance that says 'you can't leave me out the team now'." Pavlyuchenko is likely to get his opportunity in Tuesday night's Carling Cup fourth-round tie against Everton, with Redknapp set to rest several of his first-team regulars.